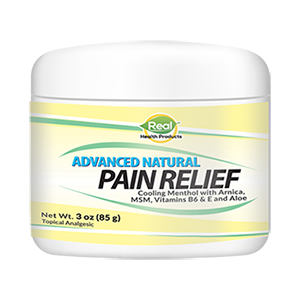 From head to toe, immediate relief from pain, gently and safely, without any need for habit-forming pain-killer drugs or medications. The RHP® Pain Relief Cream is ideal for reducing or getting rid of muscle pain, joint pain, back pain, head and neck pain, pain caused by arthritis, minor injuries, and much more. It's also perfect for pain caused by nerves. Menthol - Recognized by the FDA as an active pain reliever, menthol has been used for thousands of years in India and China to control pain naturally. Used topically, it deadens nerve endings in the skin. MSM - A natural form of organic sulfur, essential to health and found in all living organisms. Discovered to be an agent that instantly eases pain when applied to the skin, MSM relieves inflammation and swelling by increasing oxygen in the soft tissue whose nerves are the source of pain. It contributes dramatically to the reduction of pain due to arthritis, bursitis (joint inflammation) and rheumatism (stiffness of joints and/or muscles), as well as strained muscles due to over-exertion. Aloe Vera - Contains at least 140 substances beneficial to the body and has been widely used for 3,500 years. A huge variety of injuries and ailments are benefited due to its ability to reduce inflammation and pain, inhibit infection and promote new cell growth. For these reasons it significantly advances the healing process. Our Advanced Natural Pain Relief Cream contains special ingredients that turbo charges them deep into the affected tissues to give rapid, safe and long-lasting relief with no unwanted side effects. We're so sure about the effectiveness of the RHP® Advanced Natural Pain Relief Cream and that you will experience relief from pain, that we offer a 90-day money-back guarantee on your initial order. The jar is on sale for $19.70, (an $18.00 dollar savings!) from $37.70. Order your jar of RHP® Advanced Natural Pain Relief Cream below and experience the results for yourself! Order the RHP® Advanced Natural Pain Relief Cream Now!